Eggnog is the signal that the holidays are here but if you don’t like traditional eggnog then check out thebar.com . The best place to find recipes that are easy to create at home, as they have so many Christmas cocktail recipes including lots of different varieties of eggnog. That includes this amazing Baileys and Raspberry Eggnog which, believe me when I say, is the most decadent, delicious and naughty cocktail you’ll be able to find for your Christmas drinks party or just for a night snuggled up on the sofa with the fire on. 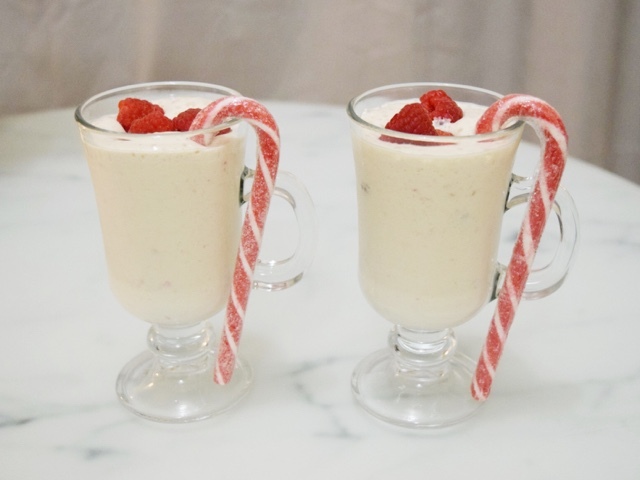 So if you fancy a ludicrously easy, quick and completely delicious themed cocktail for Christmas Eve or perhaps a replacement for the usual glass of Brandy on Christmas day, then this fruity and creamy creation is pure Christmas cheer. You could then top your drinks with whipped cream & shave some chocolate over the top using a grater or pop a few toasted marshmallows on top and serve with a candy striped straw. I decided to decorate mine with some beautiful fresh raspberries and a candy cane hung on the side of the glass to also act as a stirrer. Eggnog can be made with lots of different types of staple drinks you may happen to have in your drinks cabinet, so if you are currently Bailey’s free you can find all of the other Christmas recipes from The Bar here for something more suitable. Baileys and Raspberry Eggnog just happened to be my favourite. You’ll be able to knock these crackers up as soon as it hits December 1st. You can wow your friends and family with your newfound mixologist skills!